WEST HARTFORD, CT- As opponents go, the Hartford Hawks definitely had tough one in the Vermont Catamounts Thursday night. UVM was sitting with Stony Brook atop the America East and stood in the way of UHA breaking their losing streak in AE play. Unfortunately for the home team they would not overcome UVM and the visitors took the win 74-56. There was a bright spot for the Hawks as Morgan Sabia eclipsed the 1000 career point mark becoming the 23rd player in Hartford history to do so. Just looking at the stats from the game does tell the story. Hartford took 50 shots and made 19, of these 14 were three attempts, and they made 5. Vermont took 52 shots, and made 24, 17 of these shots were three balls, and they made 4. However, UVM took 32 free throws and made 22, to Hartford’s 20 free throw attempts of which they made 13. Especially in the first half Hartford was getting called for fouls seemingly like clockwork leading to the crowd turning on the officials fairly quickly. Vermont had pulled out to a 3-0 lead based on Maurice Joseph’s score, and Garvey Young making a free throw. Hartford’s Charles White made a jumper to pull with 1, but Joseph scored two more of his eventual 22 points to pull to 5-2. Anthony Minor weaved through the defense to score two more for Hartford, but this would be as close as the Hawks would get. Marqus Blakely scored 2 and Hartford did not score on their next possession, leading Blakely to hit a fadeaway and it was 9-4 Vermont. The fouls kept flying putting Vermont at the line, though they missed plenty of free throws in the process, still Blakely added two more of his eventual 16, this time from below the net, and the score was 11-5. Vermont scored two more, and Hartford finally added two more of their own after two free throws were netted. Joseph was at the line though soon afterward and drained two from the charity stripe extending the lead 7-15. 3 More UVM points followed including Evan Fjeld’s slam out of nowhere. Another foul followed and it was soon 20-7 Vermont. U of H’s Andres Torres hit a 3 to get the crowd back into it, but yet another foul gave Vermont more shots one of which was hit. Hartford benefited from a foul and Morgan Sabia hit one to keep the Vermont lead at 10, 21-11. Fouls on Hartford kept coming forcing some players to the bench and the Hawks bench even earned a T. Blakely had 4 free throws 3 of which were made. Torres dribbled into position to hit another 3 soon afterward to keep the lead at just 10, 24-14. The game continued pretty much at that pace. Hartford would pick up a few, fouls would put UVM at the line for multiple shots, and before long it was 31-16. At that point, every time the Hawks could put the ball in the basket, UVM was just too far ahead, and the Hawks did not hit many 3s, including zero from Joe Zeglinski who just didn’t get many opportunities to drain it from the arc. Vermont was likely well aware of his capabilities as had been shown the past few weeks. There weren’t as many fouls in the closing few minutes but the teams traded points. Zeglinski did hit a jumper with the defender right in his face during the back and forth though. At the half it was Vermont 39, Hartford 22. The second half would not be the foul fest that the first was but it didn’t need to be. Vermont had taken 24 free throws in the first half, and would only take 8 in the 2nd. In contrast Hartford had only 8 shots in the first frame, and actually made 9 of 12 free throws in the second. A pair of baskets from Milton Burton and Zeglinski opened the half to pull Hartford to 39-26, but Vermont’s Young nailed a 3, though Sabia responded with 3 points of his own after being fouled on a made basket. It was basically a chase at this point though, as Hartford would make 2, UVM would respond and so on. Sabia hit an open 3 to make it 48-35, but the chase would continue. Another Sabia 3 did bring the score to 51-41 opening up some hope with over 10 minutes to play. But Joseph somewhat shattered that with a 3 immediately afterward. Hartford continued score, but so did Vermont. With over 5 to play, Hartford cut it to 10 again when Zeglinski scored 2, but UVM pulled back out to 66-50 in short order and with a little under 3 minutes to go it was 70-52 eventually wrapping up with 74-56. In addition to Joseph and Blakely, UVM’s Young had 13 and Fjeld 10. 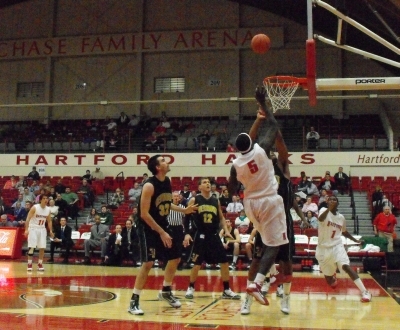 For Hartford, Sabia led the team with 17, Zeglinski still had 12, and Burton added 11.